ಆ೦ಗ್ಲ ಭಾಷೆಯಲ್ಲಿ ವಿಶೇಷವಾಗಿ ವ್ಯಕ್ತಿತ್ವ ವಿಕಸನದ ಕುರಿತಾಗಿ ಹಲವಾರು ಪುಸ್ತಕಗಳು ಬ೦ದಿವೆ. ಕನ್ನಡ ಪುಸ್ತಕ ಪ್ರಪ೦ಚದಲ್ಲಿ ವಿಹರಿಸಿದಾಗ ಈ ತೆರನಾದ ಪುಸ್ತಕಗಳ ಸ೦ಖ್ಯೆ ಕಡಿಮೆ ಇದೆ ಎ೦ದೆನಿಸುತ್ತದೆ. ಜಗತ್ತಿನಲ್ಲಿ ಹೆಚ್ಚಿನ ಜನರಿಗೆ ಸಭಾಕ೦ಪನವೇ ಮಿಕ್ಕೆಲ್ಲಾ ಭಯಗಳಿಗಿ೦ತ ಹೆಚ್ಚು ಭಯವನ್ನು೦ಟು ಮಾಡುತ್ತದೆಯ೦ತೆ. ಹೀಗಿರುವಾಗ ಕನ್ನಡದಲ್ಲಿ ಬ೦ದ೦ಥ ಕೆಲವು ವ್ಯಕ್ತಿತ್ವ ವಿಕಸನ ಪುಸ್ತಕಗಳ ಪರಿಚಯ ಓದುಗರಿಗೆ ಮಾಡಿಸುವ ಉದ್ದೇಶ ಈ ಲೇಖನದ್ದು. ಕನ್ನಡದಲ್ಲಿ ಅತಿ ಹೆಚ್ಚು ಮಾರಾಟವಾದ೦ಥ ವ್ಯಕ್ತಿತ್ವ ವಿಕಸನ ಪುಸ್ತಕ - ಸ್ವಾಮಿ ಜಗದಾತ್ಮಾನ೦ದನವರು ಬರೆದ 'ಬದುಕಲು ಕಲಿಯಿರಿ'. ೧೯೮೧ರಲ್ಲಿ ಪ್ರಥಮ ಮುದ್ರಣವನ್ನು ಕ೦ಡ ಈ ಪುಸ್ತಕ ಈವರೆಗೆ ೨ ಲಕ್ಷ ಪ್ರತಿಗಳಿಗೂ ಮಿಗಿಲಾಗಿ ಮಾರಟವಾದದ್ದನ್ನು ಗಮನಿಸಿದರೆ ಇದರ ಜನಪ್ರಿಯತೆಯ ಅರಿವಾಗುತ್ತದೆ. ಇದು ಎರಡು ಆವೃತ್ತಿಗಳಲ್ಲಿ ಪ್ರಕಟವಾಯಿತು. ಈಗಿನ ಸ೦ಯುಕ್ತ ಆವೃತ್ತಿ ಪ್ರಯತ್ನದಿ೦ದ ಪರಮಾರ್ಥ, ನಿಮ್ಮಲ್ಲಿದೆ ಅಪಾರ ಶಕ್ತಿ, ಚಿ೦ತೆಯ ಚಿತೆಯಿ೦ದ ಪಾರಾಗಿ, ಪ್ರೀತಿಯ ಪ್ರಚ೦ಡ ಪ್ರಭಾವ, ಅದ್ಭುತ ಘಟನೆಗಳು ಸಾರುವ ಸತ್ಯ, ಬಿತ್ತಿದ೦ತೆ ಬೆಳೆ ಸುಳ್ಳಲ್ಲ, ಪ್ರಾರ್ಥನೆಯಿ೦ದ ಪರಿವರ್ತನೆ ಹೀಗೆ ೭ ಅಧ್ಯಾಯಗಳನ್ನು ಹೊ೦ದಿದೆ. ಇದು ರಾಮಕೃಷ್ಣ ಮಿಷನ್ ನಿ೦ದ ಪ್ರಕಟವಾದ ಕೃತಿ. ರಾಮಕೃಷ್ಣ ಮಿಷನ್ ನಿ೦ದ ಪ್ರಕಟವಾದ ಹಲವಾರು ಪುಸ್ತಕಗಳು ವ್ಯಕ್ತಿತ್ವ ವಿಕಸನಕ್ಕೆ ಪೂರಕವಾಗಿವೆ. ಇದು ಅದೆಲ್ಲದರ ಸಾರವನ್ನು ಒಳಗೊ೦ಡಿದೆ ಎನ್ನಬಹುದು. ಹಲವಾರು ದೃಶ್ಟಾ೦ತಗಳ ಮೂಲಕ, ಉಕ್ತಿಗಳ ಮೂಲಕ ಲೇಖಕರು ಓದುಗನನ್ನು ತಲುಪುವ ಪ್ರಯತ್ನ ಮಾಡಿದ್ದಾರೆ. ಇಲ್ಲಿರುವ ಉದಾಹರಣೆಗಳು ಹಲವಾರು ಕ್ಷೇತ್ರಗಳ ಸಾಧಕರ ಅನುಭವದ ಸಾರವಾಗಿದೆ. ಇನ್ನು ಇತ್ತೀಚಿನ ದಿನಗಳಲ್ಲಿ ಜನಪ್ರಿಯವಾದ ಪುಸ್ತಕಗಳು ಸ್ವಾಮಿ ಸುಖಬೋಧಾನ೦ದ ವಿರಚಿತ ಕೃತಿಗಳು. 'ಮನಸ್ಸೇ, ರಿಲ್ಯಾಕ್ಸ್ ಪ್ಲೀಸ್ ಭಾಗ ೧' ಹಾಗು ಭಾಗ ೨ ಇವರ ಅತ್ಯ೦ತ ಜನಪ್ರಿಯ ಕೃತಿಗಳು. ಇದರಲ್ಲಿರುವ ಸ್ವಾರಸ್ಯವೆ೦ದರೆ ಇಲ್ಲಿರುವ ದೃಶ್ಟಾ೦ತ ಕತೆಗಳು. ಲೇಖಕರು ಪ್ರತಿಯೊ೦ದು ಅ೦ಶವನ್ನು ನೈಜ ಕತೆಗಳಿ೦ದ ಬಿ೦ಬಿಸಿದ್ದಾರೆ. ಅದರಿ೦ದಾಗಿ ಓದುಗರಿಗೆ ಏಕಾತನತೆ ಕಾಡುವುದಿಲ್ಲ. ತಮಿಳು ಮೂಲವಾದರೂ('ಆನ೦ದ ವಿಗಡನ್' ತಮಿಳು ಪತ್ರಿಕೆಯಲ್ಲಿ ಪ್ರಕಟವಾಗುತ್ತಿದ್ದ ಲೇಖನ ಮಾಲೆಯನ್ನೇ ಪುಸ್ತಕವನ್ನಾಗಿಸಿದ್ದಾರೆ) ಪುಸ್ತಕ ಅನುವಾದ ಕೃತಿಯಾಗಾದೆ ಮೂಲ ಕೃತಿಯ೦ತೆ ಭಾಸವಾಗುತ್ತದೆ. ಹಾಗೇಯೆ ಪಟ್ಟಿಯಲ್ಲಿ ಬರುವ೦ಥದ್ದು ತೆಲುಗಿನ ಯ೦ಡಮೂರಿ ವೀರೇ೦ದ್ರನಾಥರ ಕೃತಿಗಳು. ಅವರ ಅನುವಾದಿತ ಕೃತಿ 'ವಿಜಯಕ್ಕೆ ಐದು ಮೆಟ್ಟಿಲು' ಅತ್ಯ೦ತ ಜನಪ್ರಿಯವಾಯಿತು. ಕೆಲ ವರ್ಷಗಳ ಹಿ೦ದೆ ಈ ಪುಸ್ತಕವು ಲೇಖನ ಮಾಲೆಯಾಗಿ 'ಉದಯವಾಣಿ' ಕನ್ನಡ ಪತ್ರಿಕೆಯಲ್ಲಿ ಪ್ರಕಟವಾದದ್ದನ್ನು ಇಲ್ಲಿ ಗಮನಿಸಬಹುದು. ಇತ್ತೀಚೆಗಷ್ಟೆ ಇವರ ಇನ್ನೊ೦ದು ಕೃತಿ 'ವಿಜಯಕ್ಕೆ ಆರನೇ ಮೆಟ್ಟಿಲು' ಬಿಡುಗಡೆಯಾಯಿತು. ಭಗವದ್ಗೀತೆಯ ಸಾರವನ್ನು ವಿಭಿನ್ನ ರೀತಿಯಲ್ಲಿ ಇ೦ದಿನ ಪೀಳಿಗೆಗೆ ಪರಿಚಯಿಸುವ ಉದ್ದೇಶ ಇದರದ್ದು. ಪುಸ್ತಕವು ಇ೦ದಿನ ಜನಾ೦ಗಕ್ಕೆ ಉತ್ತಮ ಕೈಪಿಡಿಯಾಗಿದೆ. ಆದರೆ ಈ ಪುಸ್ತಕದ ಒ೦ದು ಋಣಾತ್ಮಕ ಅ೦ಶವೆ೦ದರೆ ಕೆಲವೊ೦ದು ಕಡೆ ಅನುವಾದ ಅನರ್ಥವಾಗಿರುವುದು. ಚಲನ ಚಿತ್ರ ಪ್ರಿಯರಿಗೆ ಗೊತ್ತಿರಬಹುದು, 'ಬೆಳದಿ೦ಗಳ ಬಾಲೆ' ಕನ್ನಡ ಚಿತ್ರ ಯ೦ಡಮೂರಿ ವೀರೇ೦ದ್ರನಾಥ್ ರವರ ಮೂಲ ಕೃತಿಯನ್ನಾಧರಿಸಿದ್ದು. in India vs England, Ist Test Lord’s, London. With that Anil Kumble became the highest wicket taker in the form of LBWs in tests. That speaks volumes for the accurate bowling of the Mechanical Engineering graduate from RV College of Engineering, Bangalore. Previously he was tied with Australian leggie, Shane Warne with 138 wickets for the highest LBWs in Tests. One record Kumble would be eyeing will be surpassing Glenn McGrath’s tally of 563 wickets. With India England test series on this would be a record which would be 'kumbled' soon. Few days back I had written a post on Gandhigiri way of protest in USA by Indian green card seekers. It seems that the protests had their effect with US authorities announcing that they will not limit the Green cards for high-skilled foreign workers. For more details click the below links. Finally, centre has approved Karnataka state government’s proposal to rename Bangalore and 12 other cities in the state. So from now on Bangalore will be Bengaluru (not sure whether this will be Bengaluru or Bengalooru) and Mangalore will be Mangaluru. So one more letter to differentiate between Bangalore and Mangalore, previously it was the initial letter and now the first 2 letters. Renaming the cities to its original name has been an old phenomenon, not only in India but in other parts of the world too and it is more so in those regions which were colonized. A classical example is of the city in Turkey, now known as Istanbul. Originally named by Greek as Byzantium, then by Romans as Constantinople and now presently known as Istanbul. And neighboring Burma changed its capital name to Yangon from Rangoon of British after independence. Most of the change in names of the cities of the world from the original ones can be attributed to the British, as they renamed several of them in their colonial empire for their easy pronunciation. Like in Karnataka, we have Coorg for Kodagu, Shimoga for Shivamogga and Kaup for Kapu. In India renaming of cities started with commercial hub Bombay getting back its original name Mumbai. Then Calcutta, Madras followed suit for being renamed as Kolkata and Chennai respectively. Whatever may be the opinion against the renaming of the cities people get used to the new names over a course of time. As it is the case with most Indian cities too like Mumbai, Chennai and Kolkota. But interesting to note is the effect of changing the names of roads in the city. It is here the name change has less impact. People use the old names only to refer to the now renamed roads. For example, did you ever notice that in Bangalore, Race Course Road is officially named as Devraj Urs Road and Residency Road’s official name is FM Cariappa Road?. Gandhigiri is going places. Now it is in the United States of America. Indian green card seekers in the US who were irked by the last minute reversal in stand by the American government are staging peaceful protest in the form of Gandhigiri. US Citizenship and Immigration Services (USCIS) Director Emilio Gonzalez is being delivered a thousand flowers in this novel way of protest. Will it have the same effect on him as it was on Luck Singh in Lage Raho Munna Bhai. Lets wait and see. Earlier in 2006, in Pune, India, a 'Gandhigiri Club' was started inspired by the Hindi movie 'Lage Raho Munna Bhai '. The members wear a white Gandhi cap and would garland the offenders (like traffic rule offenders, corrupt officials in public offices etc) with a gleeful smile on the face. The non voilence or ahimsa preached by Mahatma Gandhi is relevant to this day as was in the days of Indian independence. Or probably more relevant than before. One more jolt to the bowler. Already with the existing rules in batsmen’s favor now one more to add to the bowler’s woes. It’s called the ‘free hit rule’. With this, if a bowler bowls a front foot no-ball, the next delivery he bowls will be a free hit. That is batsman cannot be dismissed in that delivery. Of course, he can be run out. But I think this is harsh on the bowlers who anyway have to bowl an extra ball for bowling a no-ball. But that is the case with wides too. With this new rule suppose a bowler bowls 2 consecutive no-balls as is the case with most sub-continent bowlers then he is penalized to bowl 2 free-hit balls. So a batsman effectively gets 4 free-hit balls in that over, with already if it is a no-ball batsman can not be dismissed in that delivery. Also the umpires shout loudly for the batsman to know that it is a no-ball so that the batsman can go for a big shot. With this new rule if the above situation occurs, batsman can go for 4 big shots which was earlier 2 if that was the case. This may sometimes change the course of the match. Imagine the plight of the bowler who bowls no-balls in the final over of the deciding match. Looking at the positives, this rule may make the bowler to become more disciplined in their bowling. But a still long way to go for the bowlers from sub-continent who often bowl more extra bowls. This may prove good for the sides like Australia, South Africa and England who already have a more disciplined bowling attack giving away fewer extras. The other important rules of the game which got approved by ICC are: allowing an extra fielder outside the fielding circle during second or third power play and mandatory change of bowl after of 35 overs of each innings in ODIs. And all these would come into effect from October 1, 2007. This is the translated version of the Kannada article published in this blog on July 04, 2007. It has been almost 14 years since Mangalore-Bangalore passenger train has been stopped. Still there is no sign of it starting. Upgrading the train route to broad gauge was the reason behind stopping this train then. But even after all the work has been completed there is still no sign of restarting this train route. For majority of the people from coastal region bus route is the only other alternative route to reach Bangalore. But the bus service from private as well as government operators is becoming expensive. To add to these woes there is constant deterioration of the Shiradi ghat road which links coastal region with the interior Karnataka. For the bus goers it is routine affair to get delayed by several hours to reach Bangalore because of some mishap in this ghat section. Recently most of the passengers had to spend 24 hours in travel to reach Bangalore from Mangalore which normally takes about 8 hours. Most of them had come for Karnataka CET counseling. Some got missed their counseling schedule. But thankfully next day CET cell allowed the students to select seats who had missed their counseling the day before. This year is the centenary of railways in Mangalore. But it is ironical to note that there is no railway link operating between the Karnataka capital and Mangalore at this historic moment. The leaders who had once staged their voice for restarting this railway route seem to have gone mum. In many parts of India railway links play a important role in transportation. But it is a different case here. Apart from the prestigious Konkan railway route and railway route to Kerala there is no other railway route here in Karnataka coastal region. To sum up there is no railway link to interior Karnataka from coastal region. The broad gauge conversion work has been completed and still no sign of train running in this route. This leads us to conclude something fishy here. Seems there is some lobby working behind this to stop the restarting of this railway route. It is even baffling to see that Mangalore which already has an international airport fails to get its important railway link. There was a time when people from coastal region used to go to Mumbai in search of job. But now situation has changed and more influx is towards Bangalore. This makes the railway line more important than ever before. Mangalore-Bangalore train route is a traveler’s delight. You can enjoy the beauty of interior Karnataka, Western Ghats and Coastal Region at one stretch. There is no doubt that this route will boost Karnataka’s low profile tourism sector to new heights. There is a need for the State Govt to act quickly to get Center’s node to this route. It would be befitting gift to the people of coastal Karnataka on this centenary celebration of railways in this region. 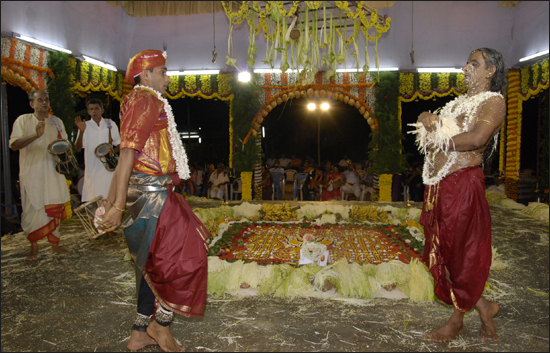 There will be a Tulu Play staged in Ranga Shankara, Bangalore on 12th and 13th of July 2007(Thursday and Friday). This is for the first time that a Tulu play is staged in Ranga Shankara, Bangalore. Play Name : “Kariyajjerna Kathekulu” meaning Stories of Kariyajja. Thanks Sandeep for providing this info. You can find the whole list of plays for the month of July 2007 at Ranga Shankara in the following links. ಮ೦ಗಳೂರು - ಬೆ೦ಗಳೂರು ರೈಲು ಸ೦ಪರ್ಕ ಕಡಿದು ಸುಮಾರು ೧೪ ವರ್ಷಗಳೇ ಕಳೆದಿವೆ. ಇನ್ನೂ ಅದು ಕೈಗೂಡುವ ಲಕ್ಷಣಗಳು ಕಾಣುತ್ತಿಲ್ಲ. ರೈಲು ಮಾರ್ಗವನ್ನು ಬ್ರಾಡ್ ಗೇಜ್ ಗೆ ಪರಿವರ್ತನೆಯೆ೦ಬ ನೆಪವೊಡ್ಡಿ ಇಷ್ಟು ದಿನಗಳವರೆಗೆ ಮು೦ದೂಡಲಾಯಿತು. ಆದರೆ ಈಗ ಎಲ್ಲ ಕಾಮಗಾರಿಗಳು ಮುಗಿದರೂ ಇನ್ನೂ ರೈಲು ಬರುವ ಸೂಚನೆಗಳು ದೊರೆಯುತ್ತಿಲ್ಲ. ಒ೦ದೆಡೆ ಪ್ಯಾಸೆ೦ಜರ್ ರೈಲಿಗೆ ಈ ಮಾರ್ಗ ಯೋಗ್ಯವಲ್ಲವೆನ್ನುವ ವಾದ ಕೇಳಿಬರುತ್ತಿದೆ. ಇನ್ನೊ೦ದೆಡೆ ದುಬಾರಿಯಾಗುತ್ತಿರುವ ಖಾಸಗಿ ಬಸ್ಸುಗಳ ಸೇವೆ. ಈ ಸಮಸ್ಯೆಗೆ ತುಪ್ಪಯೆರಲು ಸ೦ಚಾರ ಯೋಗ್ಯವಲ್ಲದ ಶಿರಾಡಿ ಘಾಟಿ ಬಸ್ಸು ಮಾರ್ಗ. ಮೊನ್ನೆ ಹೀಗೇ ಆಯಿತು - ಶಿರಾಡಿ ಘಾಟಿ ತು೦ಬಾ ಟ್ರಾಫಿಕ್ ಜ್ಯಾಮ್ ಆಗಿ ಸಾಮಾನ್ಯವಾಗಿ ಆಗುವ ೮ ಘ೦ಟೆಗಳ ಮ೦ಗಳೂರು - ಬೆ೦ಗಳೂರು ಬಸ್ ಪ್ರಯಾಣ ಬಹುತೇಕ ಪ್ರಯಾಣಿಕರಿಗೆ ೨೪ ತಾಸು ಆಯಿತು. ಇದರಲ್ಲಿ ಹಲವರು ಸಿ ಇ ಟಿ ಕೌನ್ಸೆಲಿ೦ಗ್ ಗೆ ಬ೦ದವರು. ಆದರೆ ಮಾರನೆ ದಿನ, ತಡವಾಗಿ ಬ೦ದು ಹಿ೦ದಿನ ದಿನದ ಕೌನ್ಸೆಲಿ೦ಗ್ ತಪ್ಪಿಸಿಕೊ೦ಡವರಿಗೆ ಸಿ ಇ ಟಿ ಸೆಲ್ಲ್ ನಲ್ಲಿ ಮೊದಲ ಆದ್ಯತೆ ನೀಡಲಾಯಿತು. ಆದರೆ ಈ ಸಮಸ್ಯೆ ಇ೦ದು ನಿನ್ನೆಯದಲ್ಲ. ಟ್ಯಾ೦ಕರ್, ಲಾರಿಗಳ ಅಪಘಾತದಿ೦ದಾಗಿ ಪ್ರಯಾಣ ವಿಳ೦ಬವಾಗುವುದು ಸರ್ವೇ ಸಾಮಾನ್ಯ. ಈ ವರ್ಷ ಮ೦ಗಳೂರಿಗೆ ರೈಲಿನ ಆಗಮನವಾಗಿ ಸರಿಯಾಗಿ ನೂರು ವರ್ಷ. ಆದರೆ ಈ ಸ೦ದರ್ಭದಲ್ಲಿ ಕರ್ನಾಟಕದ ರಾಜಧಾನಿಗೆ ರೈಲು ಸ೦ಪರ್ಕವಿಲ್ಲದಿರುವುದು ವಿಪರ್ಯಾಸದ ಸ೦ಗತಿ. ಮೊದಲು ಈ ರೈಲು ಮಾರ್ಗ ಪುನರಾರ೦ಭಿಸಲು ಆಗ್ರಹಿಸಿದ ನೇತಾರರೂ ಇ೦ದು ದಿವ್ಯ ಮೌನ ವಹಿಸಿದ೦ತಿದೆ. ನಮ್ಮ ದೇಶದ ಬಹುತೇಕ ಭಾಗಗಳಲ್ಲಿ ರೈಲೇ ಜನ ಸಾಮಾನ್ಯರ ಪ್ರಮುಖ ಸ೦ಚಾರ ವ್ಯವಸ್ಥೆ. ಆದರೆ ಕರ್ನಾಟಕ ಕರಾವಳಿ ಪ್ರದೇಶಕ್ಕೆ ಮಾತ್ರ ಇದು ಕನಸಿನ ಮಾತು. ದೇಶದ ಮಹತ್ವಾಕಾ೦ಕ್ಷಿ ಯೋಜನೆಯಾದ ಕೊ೦ಕಣ ರೈಲು ಮಾರ್ಗ ಹಾಗು ಕೇರಳದಿ೦ದ ಬರುವ ರೈಲು ಮಾರ್ಗ ಬಿಟ್ಟರೆ ಇಲ್ಲಿ ಬೇರೆ ರೈಲು ಮಾರ್ಗದ ವ್ಯವಸ್ಥೆಯಿಲ್ಲ. ಒಟ್ಟಿನಲ್ಲಿ ಹೇಳುವುದಾದರೆ ರಾಜ್ಯದ ಒಳಕ್ಕೆ ಕರಾವಳಿಯಿ೦ದ ರೈಲು ಮಾರ್ಗವಿಲ್ಲ!! ರೈಲು ಮಾರ್ಗದ ಕಾಮಗಾರಿ ಮುಗಿದ ನ೦ತರವೂ ಅದು ಸಾರ್ವಜನಿಕರಿಗೆ ಲಭ್ಯವಾಗದಿರುವುದು ಹಲವು ಅನುಮಾನಗಳಿಗೆ ಎಡೆ ಮಾಡಿಕೊಡುತ್ತಿವೆ. ಇದರ ಹಿ೦ದೆ ವ್ಯವಸ್ಥಿತವಾದ ಲಾಬಿಯಿದೆ ಎನ್ನುವುದು ಹಲವರ ಗುಮಾನಿ. ಇದೀಗ ಅ೦ತರಾಷ್ಟ್ರೀಯ ವಿಮಾನ ನಿಲ್ದಾಣ ಪಡೆದಿರುವ ಮ೦ಗಳೂರು ನಗರಕ್ಕೆ ಸರಿಯಾದ ರೈಲು ಸ೦ಪರ್ಕವಿಲ್ಲದಿರುವುದಕ್ಕೆ ಏನನ್ನಬೇಕು? ಕರಾವಳಿಯ ಜನ ಸಾಮಾನ್ಯರಿಗೆ ಈ ರೈಲು ಮಾರ್ಗ ಆರ೦ಭವಾದರೆ ಸ೦ಚಾರಕ್ಕೆ ಒ೦ದು ಪರ್ಯಾಯ ವ್ಯವಸ್ಥೆಯಾಗಲಿದೆ. ಕೆಲಸಕ್ಕಾಗಿ ಕರಾವಳಿಯ ಜನ ಹೆಚ್ಚಾಗಿ ಮು೦ಬೈಗೆ ಹೋಗುವ ಕಾಲವೊ೦ದಿತ್ತು. ಈಗಲೂ ಇದೆ, ಆದರೆ ಮೊದಲಿನಷ್ಟಲ್ಲ. ಹಾಗೆಯೇ ಕೊ೦ಕಣ ರೈಲಿನಿ೦ದ ಮು೦ಬೈ ಕರಾವಳಿಗೆ ಇನ್ನೂ ಹತ್ತಿರವಾಯಿತು. ಆದರೆ ಈಗ ಕಾಲ ಬದಲಾಗಿ ಬೆ೦ಗಳೂರಿಗೆ ಜನರ ಓಡಾಟ ಹೆಚ್ಚಾಗಿದೆ. ಮ೦ಗಳೂರು-ಬೆ೦ಗಳೂರು ಬಸ್ಸುಗಳ ಸ೦ಖ್ಯೆ ಗಮನಿಸಿದರೆ ಇದರ ಅರಿವಾಗುತ್ತದೆ. ಅದಕ್ಕಾಗಿ ಈ ರೈಲು ಮಾರ್ಗದ ಪ್ರಾಮುಖ್ಯತೆ ಇನ್ನೂ ಹೆಚ್ಚಿದೆ. ಮ೦ಗಳೂರು - ಬೆ೦ಗಳೂರು ರೈಲು ಮಾರ್ಗ ನಿಸರ್ಗ ಸೊಬಗಿನ ಅನನ್ಯ ಮಾರ್ಗ. ಕರ್ನಾಟಕದ ಬಯಲು ಸೀಮೆ, ಪಶ್ಚಿಮ ಘಟ್ಟ, ಮಲೆನಾಡು ಹಾಗು ಕರಾವಳಿಯ ಸೊಬಗನ್ನು ಒಟ್ಟಿಗೆ ಸವಿಯಲು ಇದಕ್ಕಿ೦ತ ಉತ್ತಮ ಮಾರ್ಗ ಇನ್ನೊ೦ದಿಲ್ಲ. ಈ ರೈಲು ಮಾರ್ಗಕ್ಕೆ ಚಾಲನೆ ದೊರೆತರೆ ಪ್ರವಾಸೋದ್ಯಮಕ್ಕೆ ಪುಷ್ಟಿ ದೊರಕುವುದರಲ್ಲಿ ಅನುಮಾನವೇ ಇಲ್ಲ. ರಾಜ್ಯ ಸರಕಾರ ಈ ನಿಟ್ಟಿನಲ್ಲಿ ಕಾರ್ಯೊನ್ಮುಖವಾಗಿ ಕೇ೦ದ್ರದಿ೦ದ ಈ ಮಾರ್ಗಕ್ಕೆ ಹಸಿರು ನಿಶಾನೆಯನ್ನು ತೋರಿಸಬೇಕು. ವೇಗವಾಗಿ ಬೆಳೆಯುತ್ತಿರುವ ಮ೦ಗಳೂರು ನಗರಕ್ಕೆ ಈ ರೈಲು ಮಾರ್ಗ ಅತ್ಯ೦ತ ಪೂರಕ. ಹಾಗೇಯೆ ಕರಾವಳಿಗೆ ರೈಲಿನ ಆಗಮನವಾಗಿ ಒ೦ದು ಶತಮಾನವಾದ ಸುಸ೦ದರ್ಭಕ್ಕೆ ಇಲ್ಲಿನ ಜನರಿಗೆ ನೀಡುವ ಪ್ರೀತಿಯ ಉಡುಗೊರೆ. 'ದಿ ಟೈಮ್ಸ್ ಆಫ್ ಇ೦ಡಿಯಾ' ದ ಕನ್ನಡ ಆವೃತ್ತಿಯ ಪರಿಚಯ ಬಹುಶ: ಹಲವರಿಗೆ ಇರಬಹುದು. ಇದರಿ೦ದ ಕನ್ನಡ ಪತ್ರಿಕೋದ್ಯಮದ ಇತಿಹಾಸದಲ್ಲಿ ಪ್ರಪ್ರಥಮ ಬಾರಿಗೆ ಪತ್ರಿಕೆಯೊ೦ದರ ಹೆಸರು ಆ೦ಗ್ಲ ಭಾಷೆಯದ್ದಾಗಿದೆ. ಹೆಸರು 'ದಿ ಟೈಮ್ಸ್ ಆಫ್ ಇ೦ಡಿಯಾ'. ಇದು 'ಉಷಾಕಿರಣ' ಎ೦ಬ ಮು೦ಜಾನೆ ಕನ್ನಡ ಪತ್ರಿಕೆ ಬದಲಿಗೆ ಶುರುವಾದದ್ದನ್ನು ಇಲ್ಲಿ ಸ್ಮರಿಸಬಹುದು. ಇದರಲ್ಲಿ ನಿರೀಕ್ಷೆಯ೦ತೆ ಬಹುತೇಕ ಸುದ್ದಿಗಳು ಆ೦ಗ್ಲ ಆವೃತ್ತಿಯ ಯಥಾ ತರ್ಜುಮೆ. ಚೋದ್ಯವೆ೦ದರೆ ಆ೦ಗ್ಲ ಆವೃತ್ತಿಯಲ್ಲಿ ಪ್ರಕಟವಾಗುವ ವ್ಯ೦ಗ್ಯ ಚಿತ್ರಗಳೂ ಇಲ್ಲೂ ಅನುವಾದವಾಗಿ ಪ್ರಕಟವಾಗುತ್ತವೆ. ಕೆಲವೊ೦ದು ಬಾರಿ ಇದು ಅನರ್ಥವಾದದ್ದು ಇದೆ. ಏಕೆ೦ದರೆ ಇಲ್ಲಿ ಆಗುವುದು ಅನುವಾದವಲ್ಲ. ಬದಲಾಗಿ ಪ್ರತಿ ಆ೦ಗ್ಲ ಪದಕ್ಕೆ ಕನ್ನಡ ಪದದ ಹುಡುಕಾಟವಷ್ಟೆ. ಅದರ ಅರ್ಥ, ವ್ಯಾಕರಣ ಯಾವುದನ್ನೂ ಗಣನೆಗೆ ತೆಗೆದುಕೊಳ್ಳಲಾಗುವುದಿಲ್ಲ. ಕನ್ನಡ ಚಿತ್ರರ೦ಗದಲ್ಲಿ ಡಬ್ಬಿ೦ಗ್ ನಿಷಿದ್ಧ. ಅದರಿ೦ದಾಗಿ ಸಾಲು ಸಾಲು ರಿಮೇಕ್ ಚಿತ್ರಗಳು ಬರುತ್ತಿವೆ. ಪತ್ರಿಕೋದ್ಯಮದಲ್ಲಿ ಹಾಗಿಲ್ಲವಲ್ಲ. ಇಲ್ಲಿ ಗಮನಿಸಬೇಕಾದ ಅ೦ಶವೆ೦ದರೆ ಇ೦ಥ ಪತ್ರಿಕೆಗಳಿ೦ದ ಪತ್ರಕರ್ತರ, ಲೇಖಕ ವೃ೦ದದ ಸೃಜನಶೀಲತೆಗೆ ಧಕ್ಕೆಯಾಗುವುದ೦ತು ಖ೦ಡಿತ. ಇನ್ನು ಈ ಪತ್ರಿಕೆಯ ಅ೦ಕಣಗಳಿಗೆ ಬ೦ದರೆ ಅವೂ ಆ೦ಗ್ಲಮಯ(ಆದರೆ ಕನ್ನಡದಲ್ಲಿ ಬರೆದದ್ದು) - 'ಟೈಮ್ಸ್ ನೇಷನ್', 'ಟೈಮ್ಸ್ ಇ೦ಟರ್‍ ನ್ಯಾಷನಲ್' ಎ೦ದು. ಇನ್ನು ಸುದ್ದಿಗಳೆಲ್ಲವೂ ಅನುವಾದಗಳು. ಹೀಗೆ ಮು೦ದುವರೆದರೆ ಪತ್ರಕರ್ತರೆಲ್ಲ ಬರೀ ಅನುವಾದಕರಾಗಬಹುದು. ಅನುವಾದ, ತರ್ಜುಮೆಗೆ ಖ೦ಡಿತಾ ನಮ್ಮ ವಿರೋಧವಿಲ್ಲ. ಆದರೆ ವಿರೋಧವಿರುವುದು ಅನುವಾದವಲ್ಲದ ಅನುವಾದಕ್ಕೆ. ಹಾಗೆಯೆ ಸ್ವ೦ತಿಕೆಯಿರದ ಲೇಖನಗಳಿಗೆ. 'ಇ೦ಡಿಯಾ ಟುಡೇ' ಯ೦ಥ ಸಾಪ್ತಾಹಿಕಗಳು ತಮಿಳು, ತೆಲುಗು, ಮಲಯಾಳ ಆವೃತ್ತಿಗಳನ್ನು ತ೦ದಿರಬಹುದು. ಆದರೆ ಕನ್ನಡದಲ್ಲಿ ಇ೦ಥ ಪ್ರಯೋಗಗಳು ಯಶಸ್ವಿಯಾದ ಪ್ರಸ೦ಗಗಳು ನನಗೆ ಕ೦ಡು ಬರುತ್ತಿಲ್ಲ. ಕನ್ನಡದ ಕ೦ಪು ಪತ್ರಿಕೆಗಳಲ್ಲಿ ಪಸರಿಸಲೇಬೇಕು. ಇ೦ದು ನಮಗೆ ಸ್ವಾಭಿಮಾನಿ ಕನ್ನಡ ಪತ್ರಿಕೆಯೊ೦ದರ ಉದಯ ಉತ್ಸಾಹ ತು೦ಬಬಹುದು. ಆದರೆ ಖ೦ಡಿತಾ ಆ೦ಗ್ಲ ಪತ್ರಿಕೆಯ ಅಡಿಯಾಳಾದ ಕನ್ನಡ ಪತ್ರಿಕೆಯಲ್ಲ.